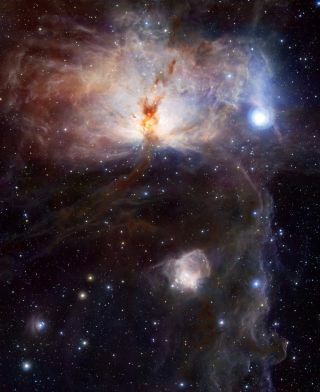 This image shows the spectacular star-forming region known as the Flame Nebula, or NGC 2024, in the constellation of Orion (the Hunter) and its surroundings. It is the first to be released publicly from VISTA, the world’s largest survey telescope, and reveals the cluster of very young stars at the object’s heart. The wide-field VISTA view also includes the glow of the reflection nebula NGC 2023, and the ghostly outline of the Horsehead Nebula (Barnard 33) towards the lower right. The bright blue star (right) is one of the three bright stars forming the Belt of Orion. The image was created from VISTA images taken through J, H and Ks filters in the near-infrared part of the spectrum. Whena new telescope comes online, astronomers are excited to see the first images.In the case of the VISTA observatory, they have every right to be excited. Thefirst images from VISTA (the Visible and Infrared Survey Telescope forAstronomy) rival the most striking photos of the cosmos taken from anyobservatory. A new view of the Flame Nebula is the most stunning, and adetailed look at stars and dust toward the middle of the Milky Way ain't halfbad, either. Thenew telescope is part of the European Southern Observatory's ParanalObservatory in the Atacama Desert of northern Chile. ?VISTAis a unique addition to ESO?s observatory on Cerro Paranal. It will play apioneering role in surveying the southern sky at infrared wavelengths and willfind many interesting targets for further study by the Very Large Telescope,ALMA and the future European Extremely Large Telescope,? said Tim de Zeeuw, theESO Director General. Atthe heart of VISTA is a 3-ton camera containing 16 special detectors sensitiveto infrared light, with a combined total of 67 million pixels, ESO officialsexplained in a statement Friday. Observing at wavelengths longer than thosevisible with the human eye allows VISTA to study objects that are otherwiseimpossible to see in visible light because they are either too cool, obscuredby dust clouds or because they are so far away that their light has beenstretched beyond the visible range by the expansion of the universe. BecauseVISTA is a large telescope that also has a large field of view it can bothdetect faint sources and also cover wide areas of sky quickly. EachVISTA image captures a section of sky covering about ten times the area of thefull moon and it will be able to detect and catalogue objects over the wholesouthern sky with a sensitivity that is 40 times greater than that achievedwith earlier infrared sky surveys. This is comparable to the step insensitivity from the unaided eye to Galileo?s first telescope, officials said,and VISTA is expected to "reveal vast numbers of new objects and allow thecreation of far more complete inventories of rare and exotic objects in the southernsky."